When it comes to playing sequels to games that a nearly flawless the first round, my preference is for a follow-up that looks to iteratively improve upon on its predecessors pitfalls without messing too much with its successful formula. 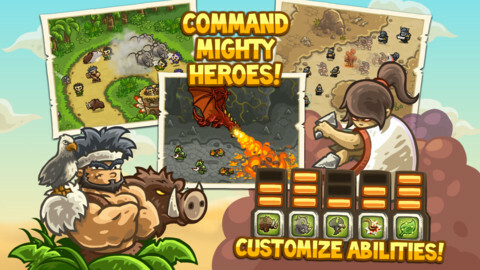 In this regard, Ironhide Game Studio’s Kingdom Rush: Frontiers ($1.99)is the perfect type of sequel for me. Preserving the smooth, well-balanced Tower Defense gameplay of the original, Frontiers adds just enough new content in towers, enemies heroes, and locales to make it another incredible experience. 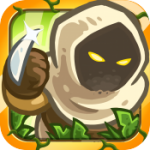 To put it succinctly, if you’ve played Kingdom Rush, you’ve played Frontiers. This sequel employs the same type of Tower Defense gameplay, art style, and presentation. Heck, even the four basic tower types return unaltered. The Three-star ranking and upgrade system also return, as well as a wealth of heroes. Unfortunately, just as before players only get a limited amount of heroes through gameplay unlocking, with the majority requiring IAP. While you don’t need these heroes to beat or experience the campaign in its fullest, the cooler ones are locked away, leaving some disappointment. Otherwise, a full-fledged campaign returns, with Heroic and Iron Challenges adding supplemental difficulty for those that desire it. Where Frontiers does make some changes is in the deeper elements of its gameplay. For starters, the advanced upgrades for each basic tower have been revamped and are now much more interesting. Mage Towers can now be upgrade to Necromancer towers, which will raise the dead of the baddies to fight for you. Another interesting upgrade lies with the Axethrowers (Archer advanced class), which lets you curse enemies to take more damage or dispel aura from the enemies. The latter is another subtle change for Frontiers. Enemies have a lot more nuanced secondary effects beyond simply attacking your defenders. Whether its shaman that bestow a variety of defense-oriented auras around their servants, queen bees that explode into little bees when defeated, or alien facehuggers that turn your defenders into a horrific (and strong) alien beasts if not defeated in time, there’s a lot more to think about beyond simple tower placement. Even the environments require more attention, as enemies will carve new paths halfway through a level, man-eating plants will take out your knights if you don’t pay attention, and other settings can reward (or punish) players that heed their surroundings. Another big component of Frontiers are one-off items that can be bought with gems, a currency that’s liberally earned by completing levels and dispatching enemies. Items range from dynamite and freeze potions that affect a small area of the battlefield, a coin package that instantly gives you more money to spend to an extravagantly expensive bomb that destroys ever enemy on screen. There’s a decent mix of items that become more and more important the further you get into the campaign. This is where I imagine some of the debate may occur. Yes, as you get further into the campaign, smart use of these one-time items becomes highly suggested to pass levels and become almost a prerequisite in order to three-star some of the harder missions. This means that players will find themselves having to actually use the gems earned and purchase items in normal course of gameplay. Considering that said gems can be purchased via IAP, I imagine some may argue that Frontiers‘ gameplay is subtly pushing towards IAP. Personally, I don’t really think that’s the case. As I mentioned earlier, gems are easily earned by playing (and replaying) matches, with enough earned after a match to pick up a few items. Considering that most players will be doing this anyways to grind experience for their respective heroes, I don’t believe currency (and thus IAP) to be a significant issue). This makes item usage just another strategic element that I appreciate rather than something as blatant as a pay wall. It sounds small, but the elements listed above make Frontiers one of the most well-rounded TD titles out there. We already Ironhide had the core TD gameplay down pat. 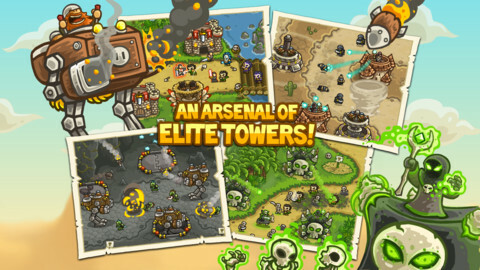 With the addition of better interactive environments, more strategic use of one-time items, advanced towers that truly differentiate between themselves and offer a wealth of strategy and enemies that actually require forethought, TD players will have to evolve to take on even more strategy from this difficult title. True, I’m not the biggest fan of the IAP heroes, and a few other nagging issues (such as the inability of the game to save runs if the game runs out of memory while suspended) do exist. However, in the great scheme of things there’s little to complain about in this excellent sequel to a great game. Next PostNext Is This The First “Made For iPhone” Controller?